Not just a bull – the herd sire you have been looking for. This guy has it all! Keystone brings features of Canadian bloodlines from his dam Fraser Lane’s Lacey and his grandsire, the famous Gusgurlach of Windrush. 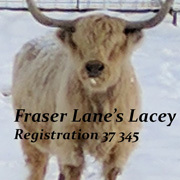 His sire is our own Skye High Hamish Macbeth. Keystone has a beautiful head and excellent black feet that require very little trimming. 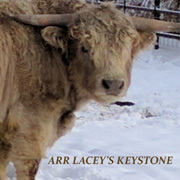 Keystone was born and bred here at Ain’t Right Ranch. He been handled since he was a youngster, and has lovely disposition to match his looks.